Now that we are heading into grilling season, and there is nothing better than pizza on the grill, you have to watch this video about using the Super Peel for transferring pizzas. Gary Casper invented the Super Peel and generously shared the Peel with me to try out. I loved it so much I asked him to do a giveaway so we could share one with you. *Leave a note in the comments below and you will be eligible to win a Super Peel. The winner is: Sandy! We’ll be in touch, Sandy. I used a Banneton to shape this loaf. It was a beautiful loaf, but not a true test of the super peel, since the dough does all of its rise in the basket, so it is only sitting on the peel for a few minutes before heading into the oven. The next one I made sat for 1 1/2 hours and it still slid right off. I slashed the dough with a lame (pronounced laam), which slid right through the wet dough. We say to use a serrated knife, but if you’re a kitchen gadget type, you may want to give a lame a try. The one I used is made from black walnut and was a gift from Sarah, but you can get a lame that work just as well, but aren’t as fancy. To successfully use the Super Peel just dust the cloth with flour, set your loaf on it, let it rise for the specified amount of time. This loaf sat for 1 1/2 hours and still slid right off, no sticking. 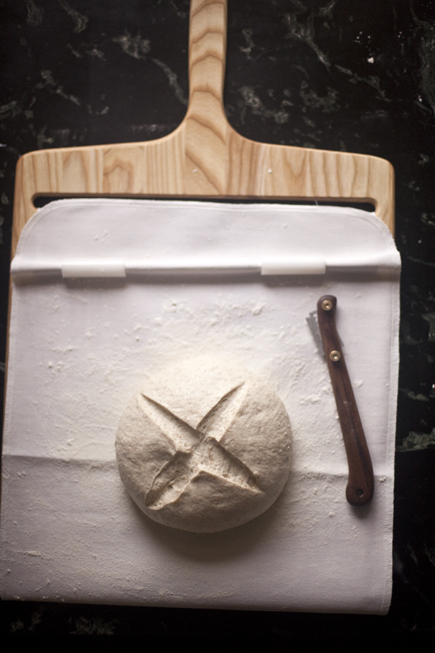 Slash the loaf and then use the Super Peel to easily slide the loaf onto the Baking Stone. The peel comes with instructions on how to assemble (easy) and how to use it (also very easy) to slide the loaf or pizza off the peel and how to them simply scoop it back up. It is a very clever system that reminds me of the deck oven loaders I used in culinary school. When I saw this peel it was a “why didn’t I think of that?” moment. So simple, but so effective. Once the loaf is baked, just put the peel up against the loaf and the cloth will pull it back onto the peel. You have to see the videos to believe it. 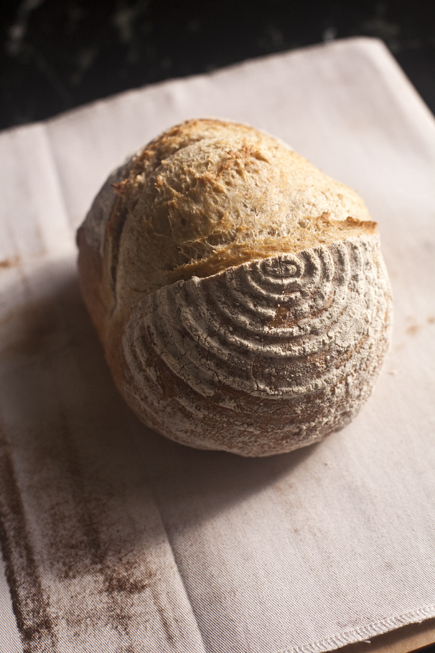 The use of the banneton gives the loaf a beautiful ringed look. Once you are comfortable with our basic recipe it is fun to play with some of these kitchen toys to get a different look to your loaves. None of these things are necessary to get a great loaf, but some make the process easier or just more fun! Leave a note below to win a Super Peel. *All of our regular contest rules apply. You can read those rules here. I’d like to see this peel in action. Wow! Would really love to try out this peel with your pizza and bread recipes! The pizza dough in 5 is an amazing dough to have. 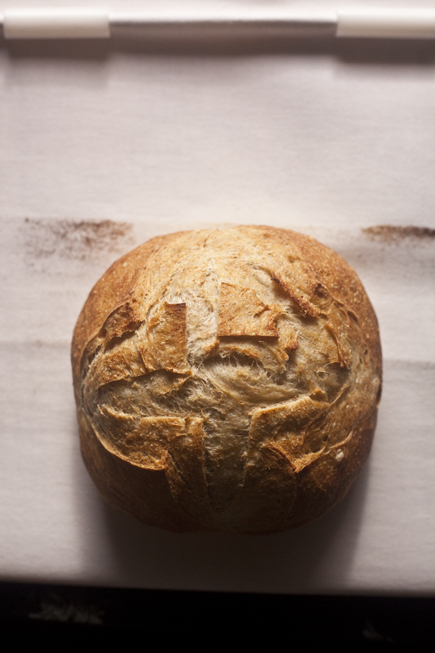 Bread is one thing I want to really master. I just learned about your books and can’t wait to give it a try. Seems like there is always a new gadget one needs. I apologize that I am not commenting on the meat of the post (the peel), but I was interested in not only the peel but also the lame. What sort of cutting techniques can be used on the bread. The amazon description made it appear as if the lame can be utilized in several different ways. Honestly, I prefer a serrated bread knife with our very-wet dough, I think it works a little better. And we cut straight down, not at an angle, because the very wet dough re-adheres to itself otherwise. This would make a great addition to your book – I got your book for Christmas and have purchased another book for my daughter – I love how easy you’ve made baking bread!! how cool! 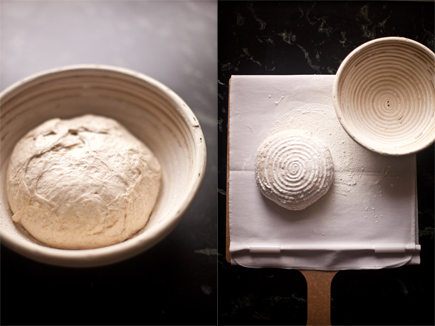 I’ve had so much difficulty transferring wet doughs to the oven, I had given up trying it without parchment. I’d love to see how these breads turn out when they make direct contact with the stone. 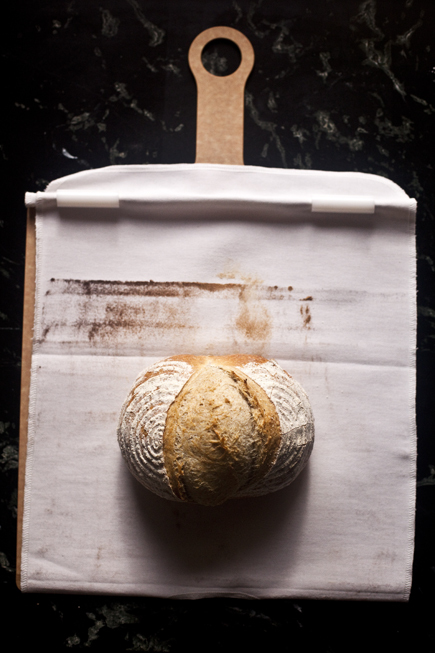 I love, love, love your recipe for artisan bread and now I am going to try the healthy recipe. I couldn’t believe how easy this was. I was used to making bread the old way of having to knead it twice before baking. What I love about this is that I don’t have to bake all the bread today. I have the option of baking a loaf anytime I want without going through the process. Thank you so much for sharing these recipes with us. I have decided to order your book, but am very grateful that you share without a purchase. Bless you both. Enjoy your cookbooks; next step adding a peel to my baking process! I borrowed your new book, Gluten-Free Artisan Bread in Five Minutes a Day, from the library. Love it! Now I intend to buy my own copy. My husband has celiac disease, and we both eat gluten-free. We have missed yummy artisan breads so much. Thank you so much for these lovely recipes. We would put the Super Peel to good (and heavy) use. Blessings! I’ve always wondered if a peel would work with your dough! So cool that it does since I’m too lazy to rise the other way now! I sometimes have trouble with my loaves sticking to the peel so I’m very interested! The peel looks fantastic! I would SO love to win one. I have resorted to using parchment paper with my peel. Wonder why I never thought of this design, it makes perfect sense. Love it! That is just what I need for transferring very thin pizzas to the oven! oh this would be amazing for gluten free loafs! I yesterday ordered your book, Danish whisk and Cambro’s by Amazon’s new same day delivery as a gift but did not see this new peel offered. Also, I do have a Baking Steel and wonder if that will benefit bread making, not just pizzas? Jeff, thank you for taking the time from your busy schedule to comment and answer a question. 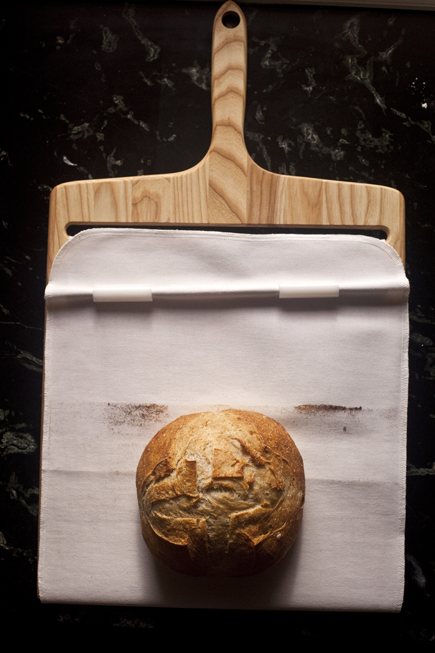 If I may so bold to ask one other, do you ever use a Silpat baking mat and would you place it on top of the Baking Steel? The perforations should allow steam to escape would it not? I have a couple of your books and the pages are getting spattered with use. I would love to win this to make my bread making even more enjoyable. I, too, use parchment paper! Where can I see a video of this? If you go to YouTube and search for super peel, or a google video search, you will find many. love that idea. nothing worse than when your amazing dough sticks to the peel. The bowl makes such a beautiful design! Would love to win the peel, mine is battered with constant use. Oh, I would love to win this peel!! I borrowed your book, The New Artisan Bread in Five Minutes a Day, from the library. I am going to add it to my library!! Whooowhoo! Loved the videos of the super peel. Would like to have one of my own. Can you also post a video of cutout cookies? We roll out the dough and then cut the shapes and it is hard to get onto a cookie sheet. Can you cut out right on the super peel? You can, and there are several ways to do it, either on your works surface or on the peel. I have a video that will who you some of this. Will try to post tonight. here is a short video that shows some cookie making options. the password is superpeel. I loved your new video that you made for cutting out cookies and baking the cookies right on the peel with a Teflon cloth. I do not see this metal peel with the different cloth on Amazon. Is it available? I’d love to win one of these! thanks for a great giveaway! This peel looks super useful! Wow! This looks amazing! Even though I only use your recipes for all our bread making ( so easy and so delicious! ), I don’t own a peel of any kind. I have been using a baking sheet instead. This peel would make my kitchen and oven far less messy! This would certainly end my frustration of my perfectly arranged pizza toppings from becoming not so pretty when I try miserably to “slip” the pizza from my peel into the oven! Would love it! This is such a great idea! And will save me so much on parchment paper! I have used an ordinary peel for your recipes. Now I am trying your gluten-free book. Since the loaves are different in texture and don’t slide off a typical peel, I wonder how super this super peel is without the gluten flour. Love the idea of saving parchment paper. If this is half as good as it looks, I need one! I just started cooking bread using your book. It’s fantastic. I would love to win this super peel for it! this looks super! I wonder how it does with high-hydration pizza crusts. It can work quite well with high hydration pizza. I make gluten free pizza very often, end use an extremely wet dough. The only caveat being, if you are using a very wet dough and roll out a very thin pizza with light toppings it can have a tendency to want to cling to the cloth as it goes around the tip of the peel. This really is more of a clinging than sticking, and is just something to watch out for. Overall it can work very well for this. Wow! Great gadget! I’ve been baking up your bread recipes for about a year. Great holiday presents and my mom was really impressed. Buttermilk dough rising in kitchen today. Can’t wait! 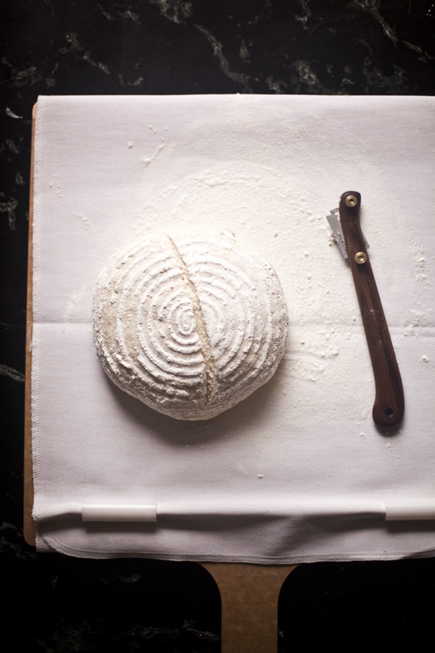 I’m making my first “artisan bread in five” loaf as I type this! 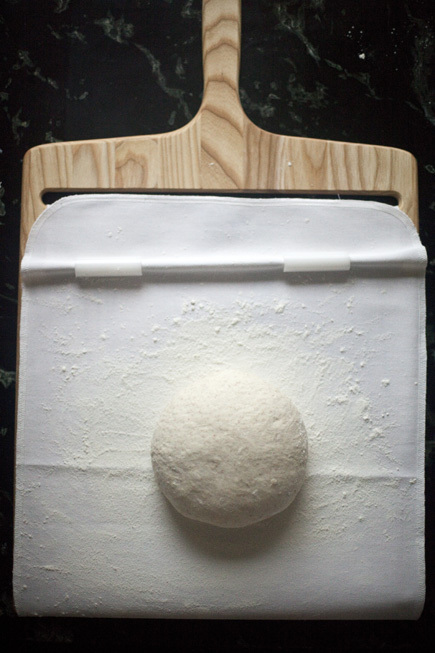 I’m so excited to see how it turns out – I can already see how this pizza peel would come in handy! I had a Super Peel a long time ago. Just went looking for it and I do believe its been swiped! My newly married daughter must have it because it’s nowhere to be found. Perhaps I could win my own….and be able to use it again! SkinnyTaste Hot Soup and Fresh Bread on a Cold Night!